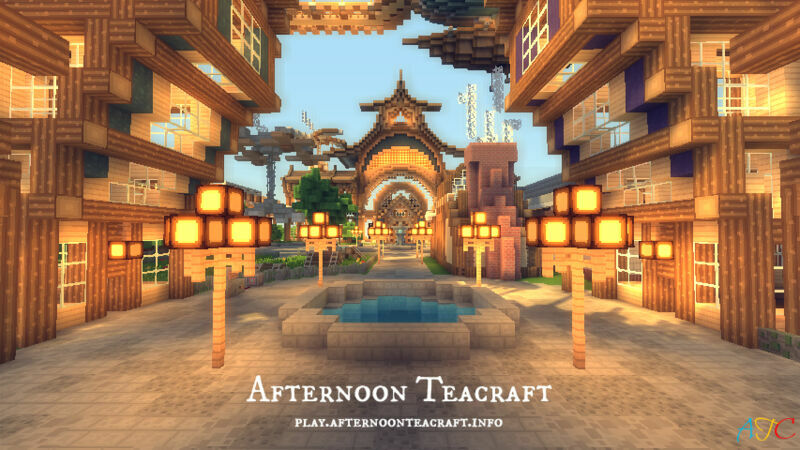 Welcome to Afternoon Tea, sit back, relax, and play some Minecraft! Launched in early 2013, ATC is a great server with a reputation for fair play, friendly staff, and a great community. We don't accept any slip ups, and we ensure everyone has a great time playing with us. Play is a little different from standard MC, with over 80 bukkit plugins to make the game more interesting, fun and secure. MythicDrops: Kill mobs, get epic unique loot (2,679,707,091,600 different items to get), what more can you ask for? PlotMe: Fancy some creative? Get a creative plot. Mob Disguises: As you rank up, you unlock more disguises! Shops: Sell your items, or buy some from other players. We currently use Quickshop. Visit our marketplace! Ranks: Rankup and get cool abilities and perks. Backpacks: Unlock the power of backpacks, hold more in your inventory! Lifts: Build yourself an elevator! Much faster than stairs. Antigrief: We monitor the server all the time, report any griefs to us and we will roll them back!